According to respective use and building size, the DIN 18041 and the Austrian standard B 8115-3 define the ideal reverberation time (e.g. that which is perceived to be most pleasant by the average person). 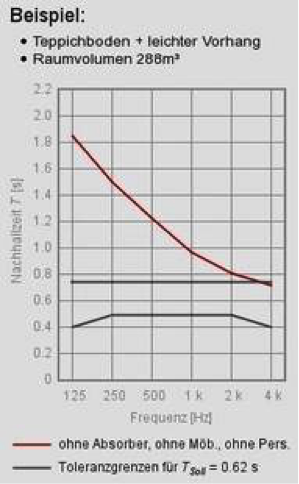 For ideal room acoustics, this reverberation time should remain more or less the same in the frequency range of 100-4000 Hz. 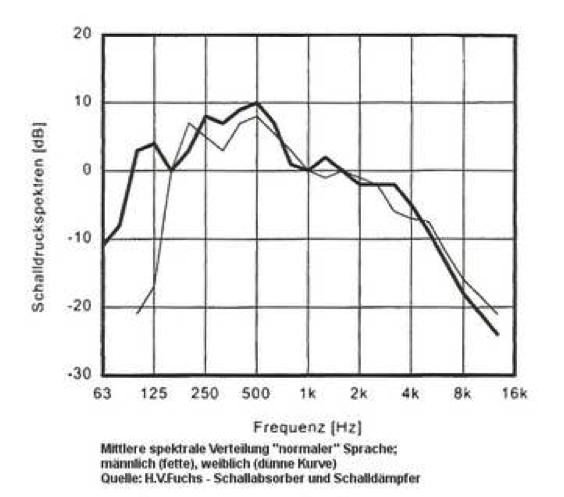 For rooms where music performances take place this value should rise somewhat where frequencies lower than 250 Hz occur. However, the linear reverberation time is better suited to music rehearsal room. 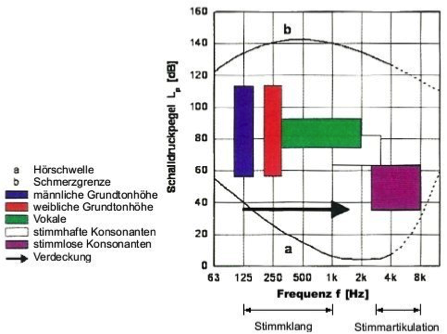 Images at right depict tolerance ranges according to standards (whereby the reverberation time of 1 second for ideal room acoustics is not likely here); tolerance range for middle frequencies plus/minus 20%. In many rooms there are materials which act as absorbers. The effect is normally in the high-frequency area. In the case of sound absorbers, it is frequently the case that only individual specifications such as (Alpha-w) αw are specified, yet in most cases, this is insufficient information. Sound absorbers of this class are often characterized as broadband absorbers, even though they are also medium and high frequency absorbers. In this example, the entire ceiling surface has been equipped with absorbers. Low frequencies are much harder to absorb than higher frequencies and are thus often simply ignored. Yet how important are these low frequencies for generally good room acoustics? This is a highly-debated topic for which there are no easy, simple answers. In order to shed light on the matter, here we present select data using speech as type of use. In which frequencies does information transmission occur when speaking? Information is chiefly transmitted in speech through consonants. Within the frequency band these are found above 1000 Hz (see diagram at right). 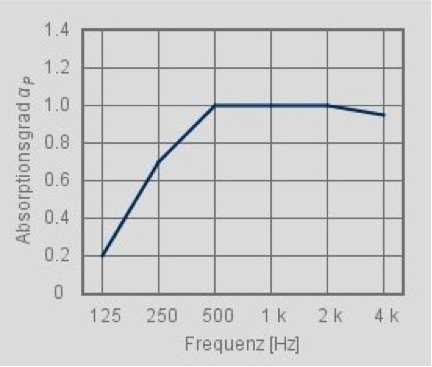 This is often used as an argument for why lower frequencies have less significance for speech intelligibility in room acoustics. 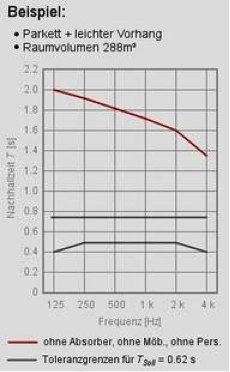 In which frequencies does the most sound radiation occur? 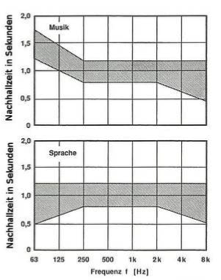 The frequency distribution of sound radiation is depicted in this diagram (source: Helmut V. Fuchs, Schallabsorber und Schalldämpfer (Springer Verlag, 2007)). Thus by concentrating on medium and high frequencies the important “information frequencies” are swallowed and the parasitic frequencies are ignored. Low frequencies however have the tendency to blanket higher frequencies – think for example of the low-frequency rumbling of a passing lorry! Only insulating the medium and high frequencies – using the argument that it is these which transmit information – fails to fulfil the necessary requirements for good acoustics. 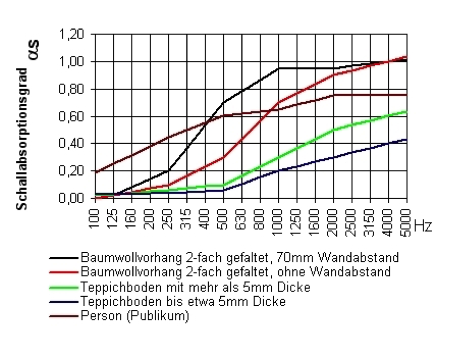 For most rooms, a linear frequency curve for reverberation time is ideal and in fact stipulated by DIN 18041. To achieve this, we have intensified our low frequency focus in product development. 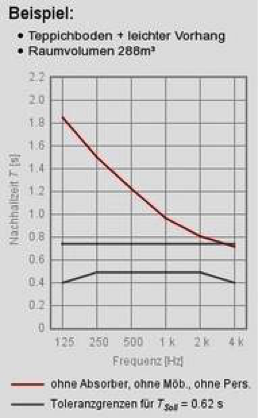 One of our research findings: low frequency absorbers used in a panel absorber configuration do not exhibit sufficiently stable absorption performance. It is easy to use our calculator to determine how to improve your room acoustics in the best way possible! Let the combination of the calculator and the relevant industry standards DIN 18041 and B 8115-3 do the work for you!